Another question I had was how do I keep them all straight? When I pick up a project that I haven't worked on in awhile...Post-its are my friend! My Shelly Valentine...this one, I actually had no idea where I was in the pattern...I had to backtrack myself and figure it out...I have now put notes in Ravelry. Raspberry Beret - At the beginning of the week, only the brim was done...I've worked a lot on this. It's such gorgeous yarn! Oh yes, procrastination is in my life too. But looking at all of your lovely projects shows that you have had a fun week. I should think that you have a super large collection of needles judging by how many projects are on them at the moment, lol. The Carlos and Arne yarn is gorgeous, and knits up a lovely design. I have yet to discover how to 'go round and round' in knitting, before I could attempt anything like these. Keep up the good work here, I love all your eye-candy. So many great projects to choose from!!! I always worry with Post It notes because they can fall off. I've been looking for the full-sheet Post Its with no luck. ::sigh:: That's why I also have notes in the notes app on my phone. I just have to make sure the boys don't get at it and delete everything. Lot's of lovely projects. I too have several and work in a similar way, whichever takes my fancy or is most appropriate. I do take notes and scribble all over the pattern, but may have to change to post it's! The Dory pic me made laugh because I've been kind of that way this year also. It sounds like you're really organized and that is smart to use Post-Its to remind yourself where you had left off of a project. Love it because that is just what a hobby should be about, bringing you enjoyment. I love seeing all your wips and what you'd like to do, it's always wonderful and I never quite know what I'm going to find when I visit, it's like visiting Aladdins Cave. I hear you on feeling a negative kind of pressure when making something for someone else. I love making things as gifts, or giving away something I've made. But I really dislike making something on a "commission" basis. Or when the other person knows I'm making the thing. Crocheting (and now, maybe knitting) are my hobbies! My pleasure-givers. I have no system, really, on what I work on when. I'm very much a "see pretty project, make pretty project" sort of gal. 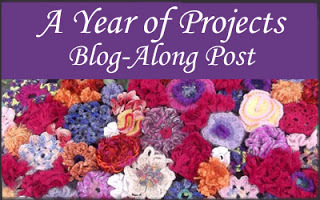 I love all your pretty projects! I like the idea of WIM. I have mamy of those too! I think I may have mentioned this before but I know people who work on a different project for every day of the week. I personally don't think I would ever finish anything because if I wasn't really enjoying working on something I would make Tuesday my rest day forever and ever and ever and that project would never get finished. I now have tonnes of unfinished projects :/ I get so sidetracked by other things! But I do go back to them every now and then. Love that self striping yarn! Wow, my head is spinning from all of your projects but to be honest it is just because they aren't my projects. 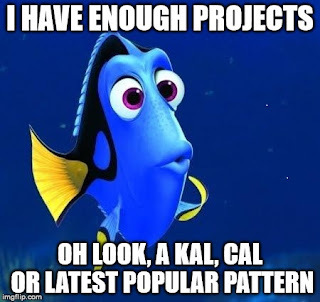 I only have lots of projects going at one time and skip around too. I do the same thing with books or different hobbies. I often have a handful of crochet projects going, a knit project or two, and a cross stitch and a bevy of books. Some people just like to change the channel a lot.